Although the layout of yards tended to be geometrical, vaguely rectangular, and enclosed, this was not always the case. Some were as terraces built off streets or roads, whilst others fronted the streets and had only one shared access to the rear of premises or their gardens. Yards were, of course, a means to an end. Owing to the Industrial Revolution and the unprecedented rise in population, which peaked during the reign of Queen Victoria, it was necessary to concentrate large numbers of dwellings into the smallest space possible, as well as to expand the town to well beyond its medi æ val boundaries. Hence much of the redevelopment has been in terms of slum clearance, for ‘ slum ’ is what many of the yards became. Buildings were tightly-compacted. Facilities, if such they could be called, were shared, sometimes even including the dwellings themselves. Washing-lines were a regular visible feature within the confines of yards, for housewives were not without competitive pride. But overall, conditions were inevitably dark and depressing. With the lack of sanitation, it is not surprising that disease was rife. Cholera and typhoid would spread rapidly. With little advance in medicine, mortality was high, particularly infant mortality. Crime also escalated as an effect of depression; some yards, like the notorious Cross Guns Yard, Balderton Gate, had a particular reputation for it. But the many people who had lost their livelihoods on the land, owing to new technology and enclosures, had little alternative but to flood into towns. Newark was by no means alone in this situation. The full extent of Newark's yards is masked by the fact that many other terms were used as suffixes to the name of the block. Thus as well as ‘ Wood's Yard ’ there was ‘ St Leonards Court ’ , ‘Jalland's Row’, ‘Tenter Buildings’, ‘Bowbridge Terrace’, ‘Mill Cottages’, ‘Elgin Place’, ‘Chain Lane’, and so on. The last-named is perhaps one of the least obvious, as it uses a term normally reserved for a rural highway, and merely connects the Market Place with Middle Gate. 3 There is also a theory that Chain Lane formed part of the original Great North Road, the reasons for this being apparent when one notes that it is part of a continuation line from Beastmarket Hill to Balderton Lane (now Balderton Gate). Chain Lane has none of the set-back features attributed to yards and does not form part of a geometrical block. Nevertheless, its arched entrance from the Market Place is characteristic, and its length is bounded on both sides by buildings, now shops but once dwellings. The Great North Road theory remains conjecture, but it is possible that Chain Lane could have fulfilled both functions. Further evidence for the likelihood of its having been a yard lies in the fact that the south side of the Market Place, continuing along Stodman Street, knew of several yards that connected to Lombard Street in a similar way to this. By and large, the arched entrances still exist, but the layout behind these has largely been lost in the 1970s construction of St Mark's shopping-centre and the multi-storey car-park. It can, however, still be discerned visually in most cases. The names also survive. Saracen's Head Yard, being among the last to go, is perhaps one of the best-known, but scrutiny reveals many other examples. Yards connecting Kirk Gate to Slaughterhouse Lane have survived better, the courtyard structure being obvious at the Kirk Gate end. Some have narrow entrances, whilst others are wider. Paxton Court has a broad entrance, intended as a carriageway rather than a footway But the north side of Slaughterhouse Lane, which until quite recently bore examples of the squalid accommodation, has given way to Morrisons supermarket. Many of Newark's yards came into being as infilling at the back of existing houses. Old photographs of St Mark's Lane car park, the immediate predecessor of the multi-storey car park, bear witness to previous yards. Mr Gill's talk focused then on the names of Newark's yards and their origins. The concept of yards came into its own during the 1770s, but the Napoleonic Wars led to a lapse in building until the 1820s. It was not until the 1850s that the reports of the Improvement Commissioners led to any reconsideration of conditions. The practice of naming streets and yards was inaugurated in the middle of that decade. Many were named after local families or celebrities, whilst others were dubbed according to national personalities. In other cases, it was the titles of inns to be found at the heads of some yards that gave the names, particularly those linking the Market Place with Lombard Street. 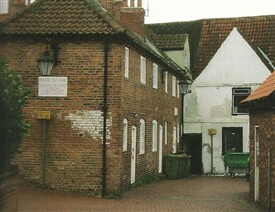 Other reputable buildings also served, giving rise to such modern names as ‘Tithe Barn Court’. Events designated other yards, whilst elsewhere it was topographical features. A common practice was to name yards after trades that were to be found there, such as ‘Nursery Place’ where there was once market-garden land. ‘Tenter Buildings’, with the aforementioned Elgin Place, was originally the largest yard in Newark with 82 houses; it took its name from the word ‘tenterhooks’, used for the drying of manufactured cloth. Consisting, as it did, of many back-to-back dwellings, this complex has now disappeared except for one house. Some trade-orientated yards, like Scales Row, were purpose-built to house employees, and enable some of the trade to take place in the home. These might be named either after the owner of the business, or after the nature of the work. Tong's (or Tonge's) Yard was named after the ironmonger who practised there, and it has been known by five different names with successive owners. 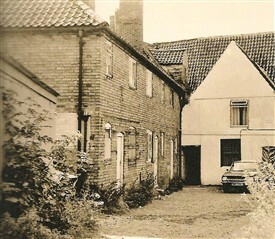 The aforementioned Scales Row was provided for the workers of the factory producing the famous blue Newark smock, an institution beside the Fosse Way (or old A46, today bypassed). Overall, Newark shows references to some700 different yards, with around 1,800 different names amongst them. A good many can no longer be found on the ground today, as the yard has long been absorbed into the street of which it formed a part. Some have bricked-in entrances; some no longer bear nameplates, and a number have been privatised and sealed-off by means of gates across the archway. It should not be assumed, though, that every archway was the access to a yard or court, as the rounded arch structure dates back to Norman times, and the pointed arch to later mediæval Gothic architecture, some of which remains. There is much on this most fascinating subject which remains to be researched, since post-war clearances, although often socially necessary, did perhaps escalate disproportionally for the sake of modernisation. But sufficient of the past remains to keep this heritage alive. © Roger Peacock for NALHS: this version prepared on 10 th May 2012. Edited by M. Gill. 3It should be noted that until the 1790s, Chain Lane was known as ‘Chain Yard’: M. Gill, May 2012. This page was added by ROGER PEACOCK on 10/05/2012.